When you’re backpacking or camping, minimizing the weight of your pack is a pretty big deal. 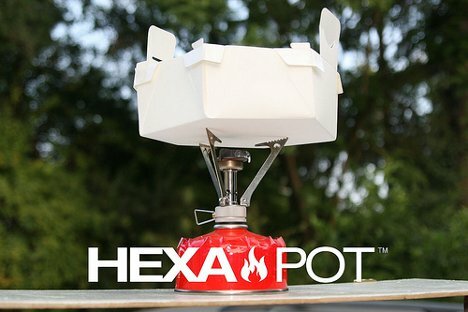 The Hexa Pot is a clever invention that lets you carry a nearly-weightless cooking pot wherever you go – and there is no cleanup required. 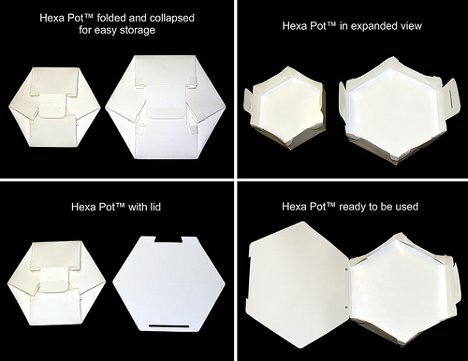 The Hexa Pot is made from a non-toxic waterproof coating on biodegradable paper. It comes flat and quickly pops open into its hexagonal shape. When you’re done cooking with it, you don’t have to worry about washing it – just throw the pot into your recycling bin. The pot can cook anything liquid, including noodles and soup. This is the secret to the paper pot’s usefulness: as long as there is liquid in it, the paper will not catch fire. 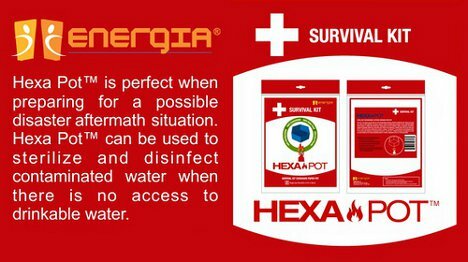 One of the most promising uses of the Hexa Pot is sterilizing water in emergency situations. And thanks to the pot’s flat-pack design, it can easily be stowed away in emergency kits until it’s needed. See more in Home & Personal or under Gadgets. July, 2012.